SM Madives - is multipurpose responsive Magento theme with +6 homepage layouts and lots of unique features that enable you to create your online shopping store with the cost-effective way. The amazing theme is built with responsive layout, RTL supported, Image Slideshow with smooth transition effect, many pre-made static blocks, ajax layered navigation, ajax cart pro, multi-language, multi-currency, brands slider, product hover effect and so on. 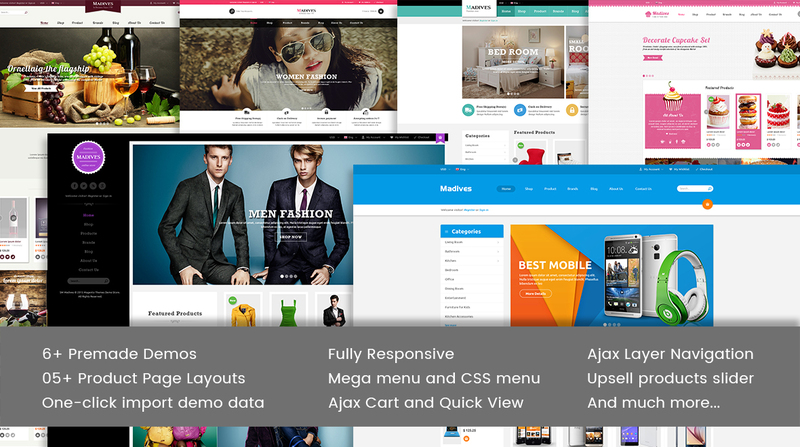 The multi-purpose Magento theme is built with new web technology: Bootstrap 3, Font Awesome 4, LESS, CSS3, HTML5 that makes the theme more powerful and flexible. With our mega menu, you can create menu with up to 6 columns to display categories and products with description, price, image, video, effects... or even add links to any page, static blocks with promotion banners and modules. It's so convenient for customers to view quickly detail product on the Homepage, Listing page without leaving the current page. Your product detail will open with full necessary information like: image product, product price, description, product reviews, product attributes and link to the product detail page, etc. You can turn on/off "Quick View" option easily in the Admin Panel. Easily switch between different languages and currencies. Overseas buyers can view your site with their language or currency just by one click. No need to waste time struggling to create CMS Blocks or pages. We integrated One-click import function in this theme. Just simple with once-click you can import easily CMS blocks and pages with sample content from the demo. Allows you to control appearance of your product such as product name, image, reviews and other useful information in organic Google search results, increasing click through rates and improve quality traffic to your store. To enhance the customer's shopping experience, we are integrated SM Shop By extension - a great extension come with Ajax technology that helps customer filtering products without refreshing page. By selecting Category, Price or Manufacture, your customer can find exactly product they want faster. Pop-up Image: Allow customer to quickly view a full product image on the fancy box popup. Display as a gallery slider to show all related images of this product. 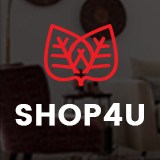 Related Products: Allow you to display more related products in a category with product images, descriptions and more as well as access detail product page to purchase these items. Social network : The best way to share your product to the world. We are integrated many social channels and share button to you. SM Madives offers users 6 different types of product profile to choose from. You can select an appropriate one for different products to sell the products.